You have probably heard of the term medical consent for a long time. And, if you haven’t used it before, or met with someone who has, you probably do not know what it is. 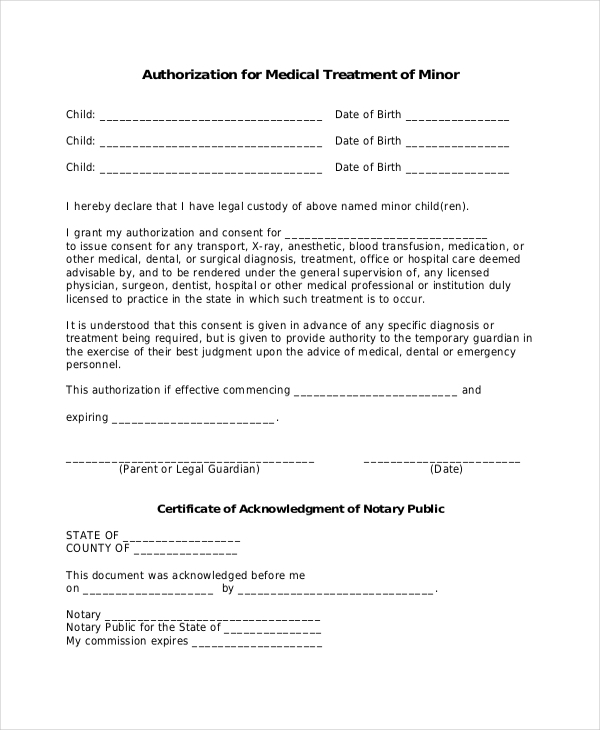 A medical consent form is what is known as the medical authorization form. 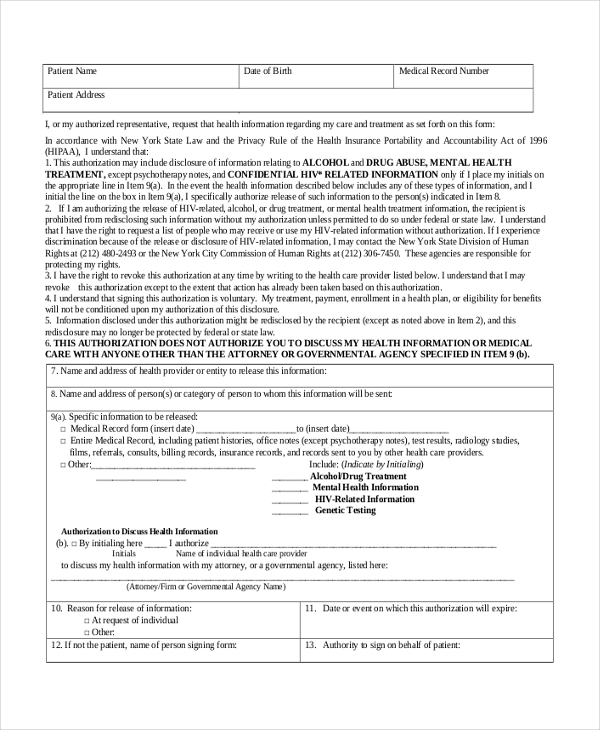 It is the document a patient, or a caregiver of a patient, signs to give permission to a doctor to conduct a medical procedure or share personal medical information with the public. The public in this context are the persons who should know about your medical history. 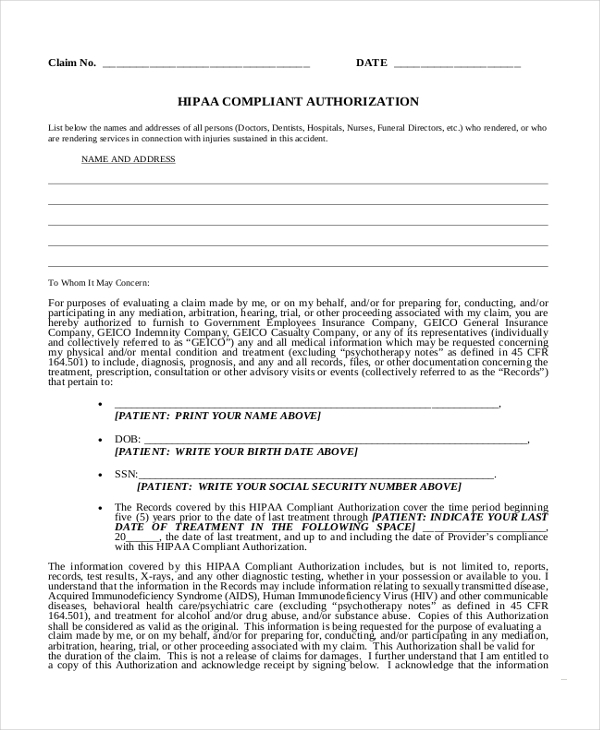 Here are a few Authorization Forms to use for the medical authorization. A doctor will most likely request you to write a medical authorization note for medication. 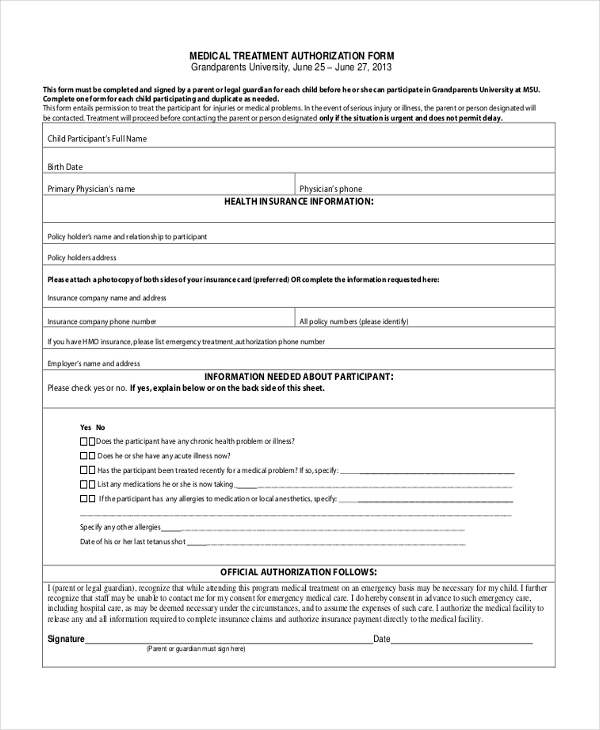 As such, you can use this form to authorize a doctor to give medication to someone who needs it. Releasing your medical information is not something a doctor can do at will. That is why you need a consent form. It enables you to give them the go ahead to release your information as instructed by you. You may also see Medicare Application Forms. Before a doctor can treat you, they will ask you to authorize them to conduct the treatment. As such, you will need a sample form that can help you do exactly that. The form below is a good one. 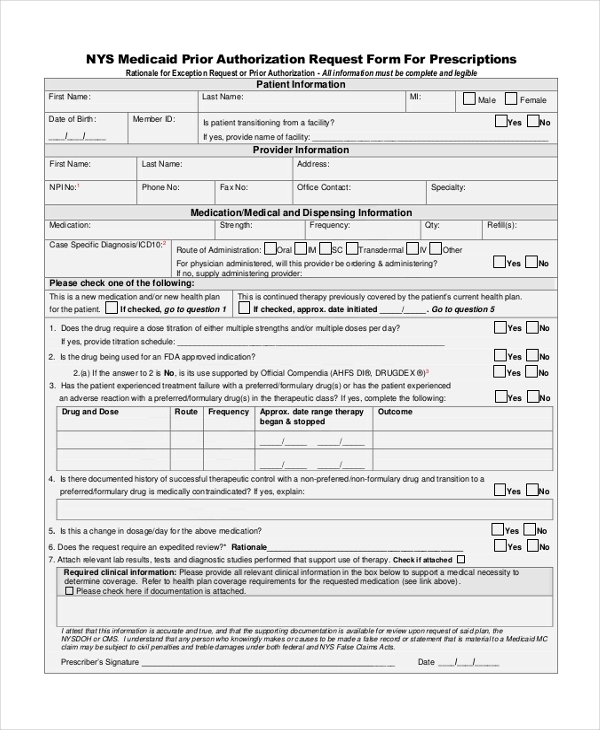 If you have a child that must get medical attention, you should use this sample form to give a doctor the permission to go on with the treatment. The sample file is free to download and quite easy to use. You can also see Medicare Forms. There is no magic formula to using this form. All you have to do is to download the file, and then use it to give consent for the medical operation. The sample form template is available for free download. If you are looking for a form that you can download for free, you will find this one quite useful. At the end of the day, the document will save you a lot of time and energy. Download the file now. You may also see Medical Choice Forms. 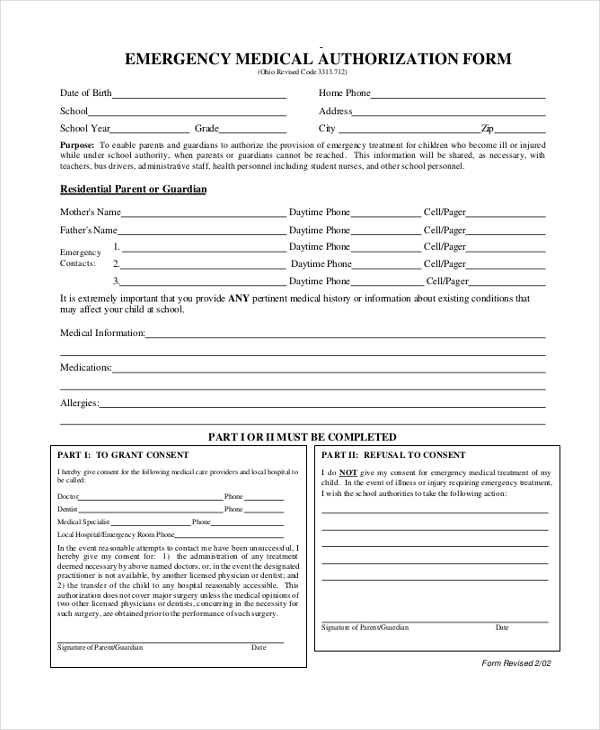 Because doctors prefer written content to spoken words, it will be necessary that you use this sample form to give the consent to continue with an emergency operation. Download the sample form for free. Doctors must seek legal medical consent before they can treat anyone. This is a policy in many healthcare institutions these days. As such, you should fill this form to give the doctors the go ahead to carry on with their intended operations. 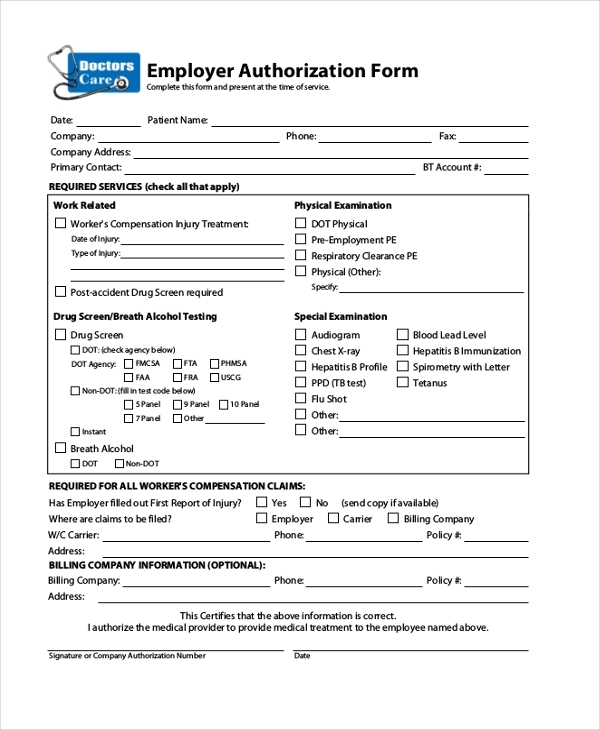 you can also see Medical Application Forms. HIPAA has always done the best to protect their patients’ information. As such, anyone who wants to gain access to your medical data must first pass throughout. You can use this sample file if you are fine to authorize them. You may also see HIPAA Authorization Forms. What do you do if you are an employer who makes medical decisions on the behalf of an employee? The best thing is to give an authorization to a doctor on the behalf of a patient. Use the form below. 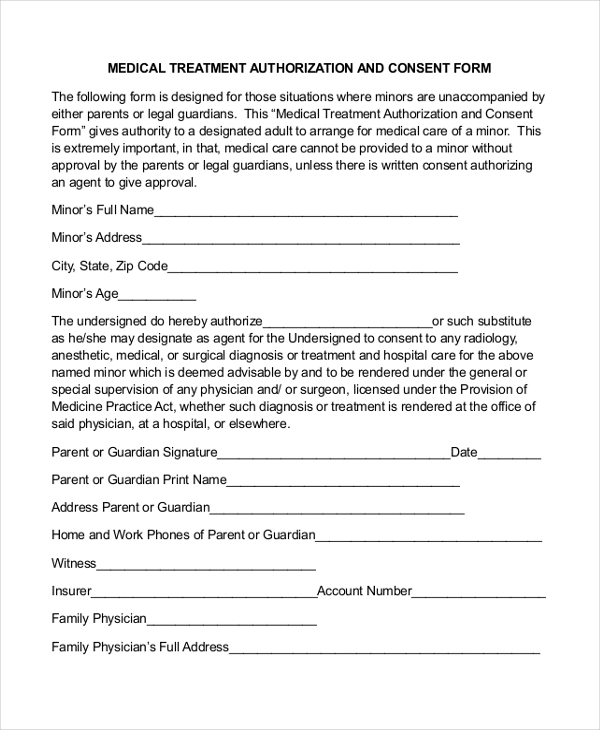 Why Medical Authorization Forms are Necessary? There are two reasons why it is important to see medical authorization from a patient first. The results of a medical procedure may be uncertain, even if the operation is necessary. It is illegal to share the medical history of a patient without their content, hence the need for these sample files. An emergency treatment requires approval before the doctors can start the treatment. There are only two main reasons why people use these forms, and why you should use them too. You use them to authorize a medication or a medical operation. This is when the doctor asks you whether you are comfortable with a medical procedure regardless of the results. If you are okay, give your consent. 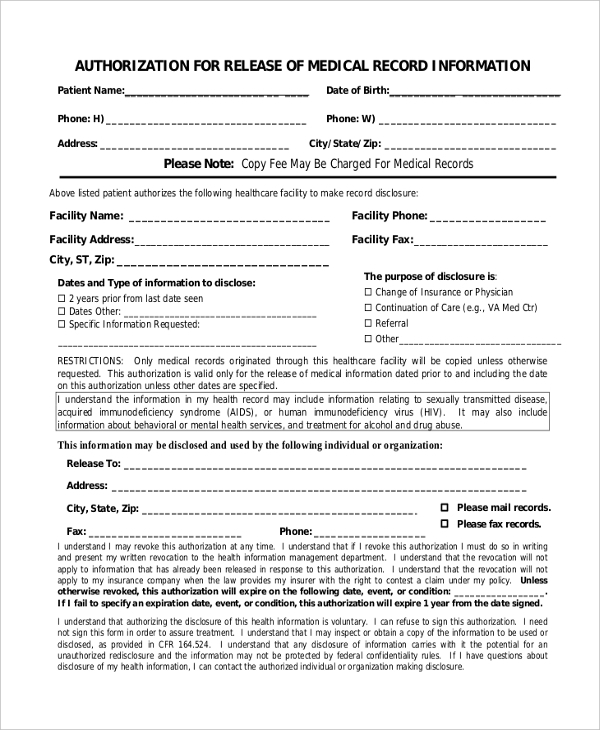 You also use the sample forms to give consent on sharing your medical history with people who ask for such information. Medical consent, better known as medical authorization, is an important aspect in the medical field. And that’s why medical persons take it seriously. At the end of the day, these sample forms will remain to be quite significant for many people. You can also see Credit Card Authorization Forms.